Hopefully everyone survived Halloween, this month we see who is giving a ‘HR trick’ or a ‘HR treat’. The clocks may have gone back here, but this month we have some forward thinking articles on topics such as; the evolution of HR systems, how L&D and HR should be more intimate, some ‘fear and loathing’ on LinkedIn, “100 is the answer, now what is the question?” with more on HR ratios and benchmarks. Finally some tips from a ‘poacher turned gamekeeper’ on how to manage consultants effectively and we’ve offered our own insiders tips. 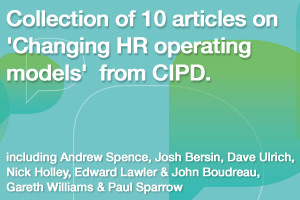 Here are 10 of the best HR Transformation articles from October. Thanks to everyone who has sent their Top 10 ideas, this is much appreciated – @AndySpence on Twitter. “We (HR) no longer create value by just serving employees, but by making sure that services we offer inside the company align to expectations outside the company” argues Dave Ulrich – Professor of Business Administration at the University of Michigan. Our HR Maverick develops this, and says “HR needs to work alongside those who understand what drives customer behaviour” and highlights the importance of ‘feedback loops’ from the customer – a key source of information about external business conditions. Glyn continues to use ideas from Systems Thinking to “help us develop HR practices able to respond to the world outside.” A great post. If I could change one thing about HR.…Nick Shackleton Jones’ wish list includes a more coherent relationship between HR and Learning & Development (L&D). · What does our workforce need to deliver? · What skills do we need, where are the gaps? · How do we embed this into our organisation? · How do we link skills with performance and the recruitment of new talent? To answer this requires the full suite of tools from both HR & L&D. In this context, any silos between HR and L&D does not make sense. This does sound like the beginning of a dodgy joke involving a ‘light-bulb’, but Mike makes a serious point. The answer of course is “it depends”. Mike outlines the factors that influence the answer. In our view, when assessing a HR function against its organisational goals, it is crucial to ask the right questions. Simply asking “what is our HR Ratio?” and how does it compare to others will not help achieve organisational goals. rather than obsess about asking the right questions. In the same vein as the previous post, Paul Leinwand and Cesare Mainardi from Booz and Company think that benchmarking encourages organisations to focus on what their competitors are doing, rather than their own capabilities. We couldn’t agree more with this view as too often we find organisations worrying about external benchmarks when it is not clear why their HR Ratio is much bigger in a particular region or business. For more on UK Government HR Benchmarks, see our post – "HR Benchmarks – A Government Health Warning"
This free PDF download from Benjamin McCall and various HR superstars is all about ‘learning’ and comes highly recommended. Some great questions and learning points for those involved in training and development as their day job, or those that rely on L&D outcomes. Steve Boese highlights a new tool on LinkedIn, called the “LinkedIn Career Explorer” to help users visualise potential career paths for college students. LinkedIn has already been a revelation in terms of networking, but eventually its real power might be enabling a more efficient matching process between talent demand and supply. If most of your current and future talent pool is publically available in one place, then the only people with “Fear and loathing” will be the traditional recruiters. We also like this article from Sharyln Lauby aka the HR Bartender, on Mashable. “5 Tips for Using LinkedIn for finding Star Employees”. The ESR system was implemented over the best part of a decade and is now in place in all NHS Trusts in England and Wales. The original strategy had ambitious plans to use a common platform to deliver shared services, however this was not fully realised and we now have a situation where we have about 600 Trusts all delivering HR processes in 600 slightly different ways, each with their own Payroll, L&D & Workforce Planning managers and teams. On top of a government spending freeze (real time cut) there will be pressure to transform the NHS workforce to do more with less, and HR needs to be well positioned to delivery this. A well planned programme to provide more effective HR services using HR Service hubs could be helpful. So there is a burning platform for change, but do we have the political will to allocate more resources to front-line service and provide better value for the taxpayer? According to Rick, public sector organisations, especially central government bodies, are often hopeless at defining what they want consultants to do. Rick has used his experience working as a consultant to share some lessons learnt with working with public sector buyers. Lynda Merritt from analysts Nelson Hall offers a summary of the key deals in the HR Outsourcing market in 2010 so far this year. Three big acquisitions have recently closed – ACS and ExcellerateHRO, ADP and Workscape, and Aon and Hewitt. This entry was posted on Tuesday, November 2nd, 2010 at 10:45 am	and is filed under HR Benchmarks, HR Blogs, HR Business Partner, HR Careers, HR in the UK Public Sector, HR News, HR Operating Models, HR Outsourcing, HR Strategy, HR Technology, HR Tools, HR Transformation, Social Media, Talent Management, Top 10 HR Transformation Articles, Twitter. You can follow any responses to this entry through the RSS 2.0 feed. You can trackback from your own site.